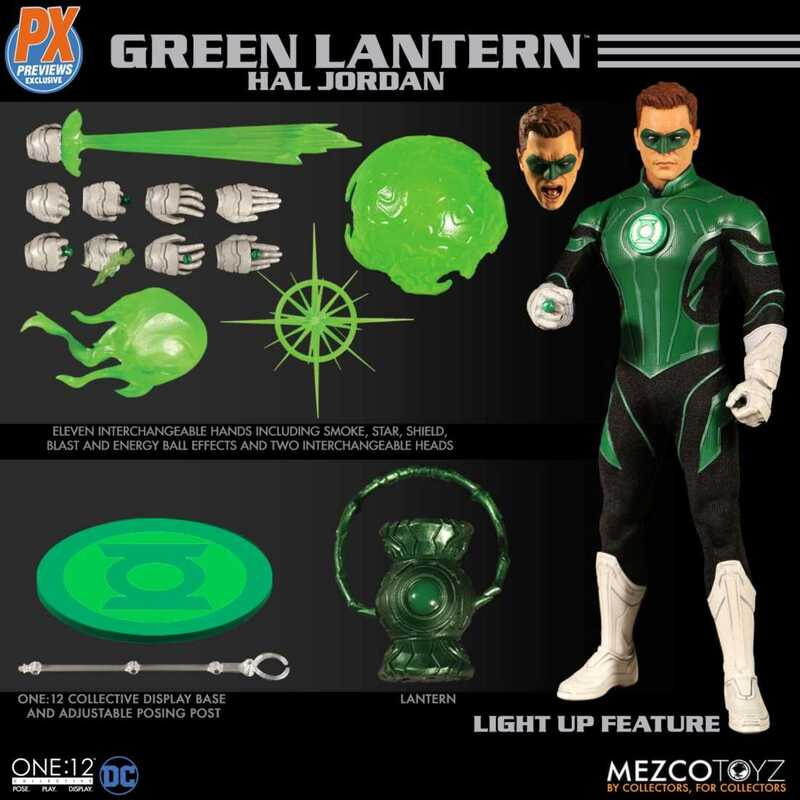 I honestly know zero about Green Lantern, but is there a reason Mezco went with the Hal Jordan as the PX and Stewart as the regular and not vice versa? I thought Hal was the original. Stewart more popular? Can't answer for anyone else, but I grew up with the JL and JLU cartoon with John Stewart, so he is my personal Lantern of choice. It depends on the era and fan base. Most people that buy these figures would be older and fans of bronze age and modern comics so Jon Stewart would be the green lantern most people grew up with. While hal jordan is the main one, Jon Stewart was all through the 80s - 90s. Kind of how most younger audiences will think more of war machine and less so than iron man. War machine was the iron man of the 90s and same goes for stewart. I love Hal Jordan - as my favorite hero for many years - but I have to pass on this. I just don't like the over-teched costume. I do tend to like the John Stewart suit better, but love Hal Jordan. So for those like me whose Green Lantern is Hal but don't like the Green Lantern Corps suit, could get both and put the Hal Jordan head on the John Stewart figure. why white boots? white gloves, yes, classic. where the hell did the white boots come from? Pretty much all PX exclusives are $5 more. They come in a big oversized tin that's more annoying than fun. Don't care for Stewart at all. Never liked him as Green Lantern. Hal Jordan all the way. Last edited by Riddick; 12-21-2018 at 01:57 PM.. There is a great simplicity to Hal's costume. This just overcomplicates it needlessly. I think the white boots are intended to compliment the white gloves. Fans have debated about the gloves for some time, and it is fair to point out that it is a weird color choice as it isn't really used anywhere else in the costume. However, I always thought they recalled some old police unis that used white gloves. I still prefer the green bands around the wrists that First Flight did. Matches the outfit way better. I feel that costume elements don't always need to color-match with another part of the costume; having one element that's a big contrast from the rest of the costume can create an interesting look, especially if there's a reason to draw special attention to that area of the body (like there is for GLs' hands, where they wear their rings); even saying that, I've always felt the gloves kinda complement the white in the emblem. I love that there are so many variations on the GL costume, but when it comes to Jordan, I am a traditionalist, including the white gloves and green boots. Even so, there are several options for Hal - green down to crotch or stops at waist, and green or black shoulders. I don't know why this is just so busy. I think Stewart is GL for most of the acton figure buying public, although more people may recognize Green Lantern as a white guy because of the Hal Jordan version. But being a PX exclusive isn't particularly special in and of itself. They aren't limited or anything. Same distributors get them as might stock comic stores and collector figure sites. But I think it looks less interesting. I am a big fan of the One:12 line. And since Hal is one of my favorite characters I had been eagerly looking forward to seeing what they would do with him. I don't mind the "tech" look of the costume. Not my first choice but I get why they might feel the need to update it. But he's never had white boots. This does change his look too much for me. Unfortunately I'm gonna have to pass on this one. Maybe they'll do another costume variant for him with a less tech-y look and the correct boots. I'm sure they will and it will probably be a hard to get Mezco exclusive! The summer convention season is right around the corner. And right after that it will be time for the fall convention exclusives. Mezco usually releases 2 exclusives for each season. Lately they've even thrown in a couple surprise bonus exclusives. So it wouldn't surprise me at all to see some Green Lantern variants. Seems to be exactly the type of thing Mezco likes to do.